Five girls. Three generations. One great American love story. You Bring the Distant Near explores sisterhood, first loves, friendship, and the inheritance of culture--for better or worse. Ranee, worried that her children are losing their Indian culture; Sonia, wrapped up in a forbidden biracial love affair; Tara, seeking the limelight to hide her true self; Shanti, desperately trying to make peace in the family; Anna, fighting to preserve Bengal tigers and her Bengali identity--award-winning author Mitali Perkins weaves together a sweeping story of five women at once intimately relatable and yet entirely new. I read my first book by Mitali Perkins in less than four hours. I was in my grandmother’s house, surrounded by sleeping family when I decided to dive in and four hours later, when I re-entered my real world, I realised that I’d fallen in love with the family, the writing, he love and the sisterhood that Mitali Perkins created over three generations of heartbreak, love and acceptance. I find it very hard to sit down and write out what I feel because You Bring The Distant Near feels like home to me, and in the best way possible. Despite the fact that I’ve grown up entirely in India, I’ve been raised in a mixed Western and Indian home environment. Watching generations of Das women grow up to find who they are, love and acceptance was such a wonderful experience after hearing my mother, her sisters and my grandmothers stories that are so similar and yet so different from these. 1. This book drew me in and it drew me in fast. From the very first chapter, Mitali Perkins had this way of creating a story that called to me on such a deep level. I understand tradition and family values and the overwhelming protection Indian and Bengali parents give their daughters. I got this book on a fundamental level and it made its way into my heart. 2. I loved reading Ranee, Sonia and Tara’s stories. They had this quaint feeling to them that comes with anything from the 90’s and I was totally invested in them. Reading their stories as they grew up and found themselves and love felt so easy, like I’d slipped inside a world that was so like mine and so enthralling. I LOVED IT. 3. Despite the fact that I LOVED the first two parts of the story with Ranee, Tara, Sonia and their father, the next generation with their daughters didn’t nearly entertain me as much. For some reason, Anna and Chantal (Tara and Sonia’s daughters respectively) didn’t capture my attention or my heart the way their mothers and grandmother did. 4. On the whole, despite not loving Chantal and Anna’s stories THAT much, it didn’t spoil the book for me in any way. 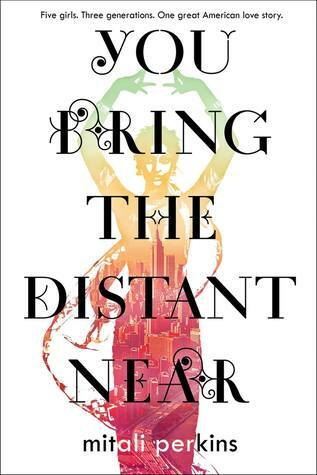 You Bring The Distant Near is unlike anything I’ve ever read and Mitali Perkins’ subtle writing has a way of bringing characters to life on a page. 1. The culture portrayed in this book – Bengali, Indian and American – was STUNNING. Mitali Perkins handled Racism, Culture, Identity, Love, Family, Tradition and Death in SUCH A STUNNING MANNER. I loved every aspect of this accepting book. A book I could never recommend enough, and one that felt like I was coming home to a family I knew and loved. I’ll definitely be picking this one up again soon. 4 stars. Mitali Perkins was born in Kolkata, India, and immigrated to the States when she was seven years old. She's written several books for young readers, including YOU BRING THE DISTANT NEAR, BAMBOO PEOPLE, RICKSHAW GIRL, MONSOON SUMMER, TIGER BOY, and SECRET KEEPER. She is also the editor of an anthology: OPEN MIC: RIFFS BETWEEN CULTURES IN TEN VOICES. Mitali maintains a website (mitaliperkins.com) and blog (mitaliblog.com), and you may also follow her at twitter.com/mitaliperkins or @mitaliperkins on instagram. Have you heard of or read You Bring The Distant Near yet? What do you think of it? What are some of your favourite YA books with Indian or Bengali Characters?